Was thinking about this today and am curious what you folks think. Does the size of a planet determine the size of the lifeforms living there? I know Earth has plenty of different sized creatures so maybe not. But I have also seen documentaries on pygmy elephants that are small because their environment is smaller. Maybe the average size would be larger or smaller. I also think gravity would play a roll in it so maybe it would be opposite of what I was originally thinking as a larger planet would likely have higher gravity and thus smaller creatures. What do you think? Re: Does planet size determine life form size? The size of a planet determines where in the "goldilocks zone" life can survive, both the Earth and the moon both lie at at the outer limit of the zone where the black body temperature is -18°C where as the Earth is sufficiently massive to maintain a insulating atmosphere giving a surface temperature of about 20°C while the moon is frozen and lifeless. There is no evidence as to the size of life forms on any other planet but living creatures on earth vary from hundreds of tons to pico grams on Earth so life is very versatile! Our only good example is Earth, so it is hard to tell. There may be factors such as the density of the organism vs the density of the atmosphere in which they live. And, factors such as wind, gravity, and food supply. Year-around food supply, of course, is important. Currently, the largest animals on Earth live in the ocean, which essentially provides a dense atmosphere where the animals have the same density as the atmosphere. Above land, the lower density atmosphere limits the size of the birds, so one doesn't see any blue whales flying. Adult Humans, of course, vary from about 3 feet to almost 9 feet. Yet, many of the tallest humans have serious knee and leg problems. Stresses on the body would be less with a lower gravity environment, so ignoring decalcification, perhaps taller people would have fewer knee problems on the moon. It is more complicated than that though. Animals such as elephants have evolved to carry heavier masses with their joints than humans. So tall, or heavy humans have problems because the bones don't scale-up to the weight, but it is possible in nature to have sturdier joints. Keep in mind. Height is a linear measurement. Area is a square measurement. Mass is a cube measurement. So, it is difficult to simply scale-up an organism. Very large dinosaurs were quite comfortable on Earth. So, perhaps it all gets back to food, flora, and fauna. Now, lets consider the other planets in the solar system. We currently don't know of any life that lives beyond Earth, but if there was, what might we find? Venus (about the same size of Earth, but closer to the sun). Very hot on the surface, and very dense clouds. Little sunlight reaching the surface. Microbial life might be able to survive floating high up in the clouds, where temperatures and pressures are more mild, and some sunlight would be visible. To live their entire existence in the sky, they would be limited in density. It is hard to imagine anything bigger than microbes evolving there, although perhaps they could form low density aggregates. Our moon (or Mercury). They are too small to have a dense atmosphere this close to the sun. The lack of a dense atmosphere along with extreme temperatures essentially prevents life as we know it from spontaneously evolving there. Mars. It has a very thin atmosphere, probably largely due to its small size and proximity to the sun. There is some curious methane on Mars. But, it is likely that any life on the planet would be subsurface, or on the surface, and thus limited in size to microbial, or very small animals. Plants, could, perhaps evolve more extensive root systems. All the moons of Jupiter are quite small, and I believe lack a dense atmosphere. Some may have ice over water oceans, but likely lack a sufficient energy density under the ice to support anything but the smallest of microbes. Jupiter is HUGE. Whether or not there is a rocky core, or something similar to a dense core, it is likely that life as we know it would only be able to evolve in the upper atmosphere. Again limiting its size, although, again, multicellular low density aggregates may be possible. Atmospheric storms may be problematic, but.... what if something could stably live in "the eye of the hurricane"? Titan is one of the smallest objects in our solar system with a dense atmosphere. But, that is likely due to its extreme distance from the sun, and thus low energy density which would limit the size of anything spontaneously evolving there. There are other forms of life on the Earth that greatly exceed the mass of the large whales, they are the trees, fungi and coral reefs indeed life is very veratile. We only need look at life here on Earth to see that it can take a vast range of sizes on just one size planet. As far as animal life is concerned, they range from the tiny (such as the Western Pygmy Blue butterfly at approx 0.003g) to the huge, the Blue Whale being the largest at over 200 tons. This is just those we can see and does not include the microscopic syhprum referred to. An example of range within a single family on an island (thus each individual species subjected to the same constraints) would be the family Chamaeleonidae, the Chameleons of Madagascar. The smallest, the Pygmy Chameleon, in adult form, is just 10mm long and half a gram in weight. The largest is the Malagasy Giant Chameleon, which will grow to around 70cms and weigh approx 2kgs. This demonstrates how, in a single environment, a single family can evolve into individual species of a wide variation of size, the largest being 4000 times the weight of the smallest. Another example would be the order Cetacea, where the lightest, the Finless Porpoise comes in at around 30kgs and 1.6m length and, as stated above, the heaviest, the Blue Whale at over 200 tons and 30m + in length. When it comes to plant life, again only accounting for those we can see, the range is even greater, being from tiny algae to the immeasurable Pando Tree, which has been estimated at a weight of some 6,000,000kgs and covers an area of over 100 acres. Yet both reside next to each other. If we take it that all life, wherever it may occur, will be regulated by a similar predator/prey (or food chain) system to that on Earth, which I think would be fair to assume, then I can envisage the same size/weight differentials being present. I don’t think the size of the planet would play any part in determining the size of it’s inhabitants. I would certainly not suggest that a giant planet could or would produce giant life forms such as those depicted in science fiction. The plain fact is that an ant twice the size of a human could not exist due to the constraints of the exoskeleton. As far as vertebrates are concerned, the largest living is the African Elephant, where the bull can weigh 6 tons. A dinosaur (Sauroposeidon) might have weighed 60 tons. But since these huge animals disappeared with the demise of the dinosaurs, one has to wonder if perhaps the Elephant is the largest practical size for a terrestrial creature, since the only bigger animals which have fared so well are those which are aquatic. That brings me to gravity field. It would probably be the case that any planet capable of supporting life would need to fall within a specific range of gravity field. A planet with the gravity field of Jupiter might be unable to support life due to the size an animal would need to be to be strong and resilient enough to survive the crushing effect of both the atmosphere and the gravity itself. Too small and bone/cell strength might be insufficient, but as size increases to accomodate greater strength, so the need for still greater strength increases. A bit of catch 22 situation. With a gravity field nearer to that of the Moon, regardless of weight and size, anything not anchored by roots would have trouble remaining on terra firma, let alone controlling it’s movement. Sticky feet, such as those of the Gecko, might help, but one slip and you could be in serious trouble. While it may be that plants existed on Earth for one or two thousand million years before animal life evolved, there can be little doubt that it was the evolution of animal life which sparked much of the variation which exists today in the plant kingdom and I think wherever life may exist it will take the same two routes into plants and animals as it did here on Earth. I seriously doubt that where plants evolve, animals would not follow. It could be that the plants needed the animals to evolve in order to survive. In which case, I suggest that life on any planet would need both animals and plants or it might be unable to evolve sufficient diversity for life to continue more than a few thousand million years. I get the feeling that the constraints of 'Goldilocks Zone' would not allow for a giant planet. The Earth seems to be rather unusual as we have in effect two atmosheres the main very dense one of water about 3 km deep with continents poking thru and a second gaseous one effectivly 10 km deep providing a variety of niches where different life forms have evolved. we must not forget our small buddies the bacteria which numericaly out number all other life forms who are small enough to be little affected by gravity. I don't think I explained myself very well here. Or perhaps the word ‘practical’ was just a poor choice. It might be fair to say that there is a relationship between time-line, O2 levels and life. 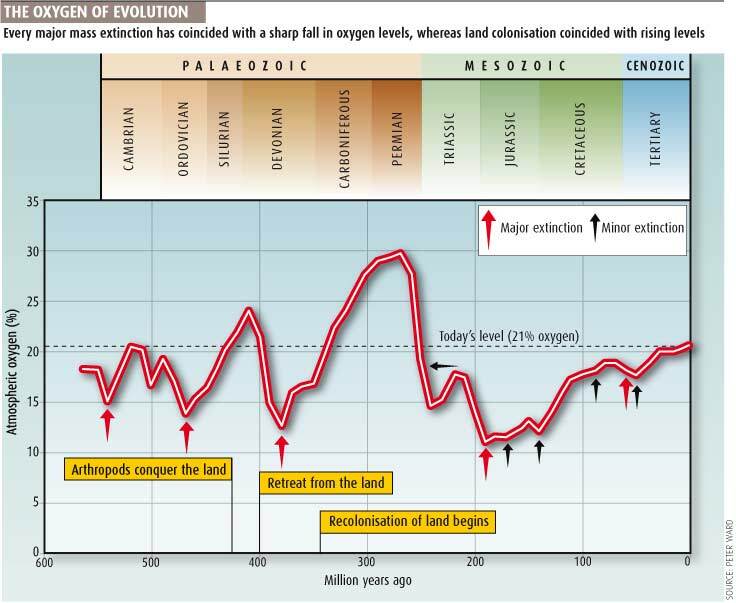 Plant life had existed for a couple of thousand million years before animals appeared, thus it is reasonable to say that they would have taken a great deal of CO2 out of the atmosphere, locking away the C and greatly increasing the O2 level. Without the emergence of animal life, plant life may well have breathed itself out of existence, but with the emergence of animal life, over a period of 400 million years or so, animals began to have their effect on the O2 levels in the atmosphere. My suggestion here is that the enormous sauropods of the Jurassic and Cretaceous periods may have been doomed to extinction regardless of the K-T Boundary, due to their own effect on the atmospheric level of O2. Since the K-T Boundary, the largest animals were a species of Elephant weighing in at 10 tons, but these became extinct, if memory serves me correct, about 500,000 years ago. To me this suggests that these huge animals were not practical as terrestrial creatures, due to the ever lessening O2 levels, resulting (partly) from their own existence. I must concede that a silicon based skeleton (or some other element) might well be capable of withstanding higher pressures and gravity and might even weigh less than a calcium based skeleton, but since we cannot know what ET might be made of, I based my supposition only on the known bone structure. I think you'll find that Earth is "Just Right". Anything much smaller, and it can't hold onto a dense atmosphere. Anything much bigger, and it traps Hydrogen & Helium which becomes a big problem. As far as oxygen, there are a number of estimates. So, there was a significant drop in oxygen levels between 300 million and 200 million years ago. Estimates indicate that the oxygen levels were once again generally increasing through the Jurassic periods, with only a minor drop around 65 million years ago with the extinction of the dinosaurs. Since then, oxygen levels have continued to increase. As far as the extinction of the Woolly Mammoth. The species survived until the Holocene, with many of them beginning to die off around 10,000 BC, but some surviving as late as 1,650 BC. Mastodons also survived until about 10,000 BC. The Megafauna extinction in North America seems at least partly related to the arrival of homo sapiens, although it is possible that the Holocene brought changes that was hard on the various species. But, then one would have to ask why they survived the Eemian interglacial period, only to be knocked off by the Holocene. Yes , in two ways . The more obvious one is mechanical . A body must be heavily over-built in order to function in Hi-G . The risk of injury is huge . Even on Earth , larger organisms die more easily from falls , infections , environmental changes , and many other reasons . The second way is planetary fertility . Larger planets will have more internal heat , crustal recycling , water , and atmosphere to transport it . Volcanic ash is a fantastic fertilizer , frequent rain creates a plant-rich environment . This type of ecosystem usually supports more large animals . Oceans this way also , if currents transport sufficient nutrients there . Otay , hope you get dis . Dead planet , poor environment , dwarf animals . Live mofo , rich environment , giant honkers ! Toodles , mahn . I'm building a ship to visit some barren islands ! 1 Mill. per pax ! P.M. I think it depends on what one would define as 'life'. Biological or just self awareness? I don't necessarily think those two are the same.